I enjoy driving my car as much as the next person. When I moved to Ireland back in ’96, I brought my Fiesta XR2 Mk2 with me, at that time the dream of many girl (or boy) racers unable to afford a Golf GTI. 1.6 litre CVH engine, 96bhp, alloys, extra fog lights, go faster stripes, rear spoiler, pop-up glass sunroof – this was to become a sought after Classic Car. Tragically, the lowered suspension made it a disaster on South Kerry roads and, being a left-hand drive, it cost a fortune in insurance. With breaking heart, I traded the XR2 against a Starlet which, back then, depressed me no end. Downsizing from 185 to 155 tyres meant a complete change in driving style: no more zooming around Dromanassig bends as if on train tracks. For the last twelve years, I’ve been driving a Suzuki Ignis and whilst it’s great to park in the tiniest corner or squeeze through the worst city traffic, it’s easily the bumpiest ride ever on our still pretty awful roads. The Iggy has tought me that it’s not all that bad to roll along at 80km/h; that one doesn’t actually arrive that much later than when barrelling along at 100km/h. At least not over short distances. This particularly busy summer is demonstrating again quite clearly that some main roads, despite being N roads, simply don’t deliver the basic safety requirements to allow traffic to travel at 100km/h. Take ‘my’ main road, for instance, the N71 between Kenmare and Glengarriff. Yes, it’s a Secondary National Road but it’s what Council Councils now fashionably call a ‘Legacy’ single dual carriageway. Its road width is comparatively narrow except for recently improved sections; it doesn’t have any hard shoulders for walkers or cyclists to escape onto when faced with oversized vehicles; forward visibility is largely poor; surface materials are – well, I won’t get rude. 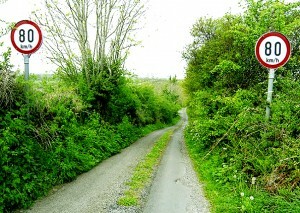 The Irish system of default speed limits is linked to road classification and road function. Special Speed Limits are set in acknowledgment of variable road conditions; traffic speeds appropriate to their immediate environment aiming at reducing road traffic accidents and their severity. You, dear Readers, will probably remember when – in the name of metrication requested by the EU back in 1980 – a couple of years ago some really dodgy speed limit signs started to appear on our roads, designating single lane ‘boreens’ barely able to support a speed of 50km/h, Tempo 80 status. Although legally correct, this waste of money by County Councils was rightly considered beyond a joke and worse: the credibility of the speed limit system overall was severely undermined. Since 2015, all Local Authorities are required to review speed limits in their administrative areas at least every five years, based on practical realities and by taking into account warnings and comments from the general public. Kerry County Council has now prepared the ‘Draft Road Traffic Special Speed Limit Bye-Laws 2018’ in consultation with An Garda Síochána. There are, of course, a number of changes in the greater Kenmare area, Kilgarvan and Sneem. The Draft Bye-Laws make for interesting reading and I was pleasantly surprised to see some good, common-sense changes proposed in our region. A Special Speed Limit of Eighty Kilometres per hour (80km/h) on the N71 Glengarriff to Kenmare road from the Cork/Kerry border at Turner’s Rock, all the way to the former Riversdale House Hotel just outside Kenmare. Also on the N71 in Bonane, parents of children attending Tulloha National School will be glad to hear that a Periodic Special Speed Limit of Fifty Kilometres per hour (50km/h) is planned from Mondays to Fridays during school terms. The speed limit would apply for 30 minutes during Morning Drop-off, and for 20 minutes each during Early and Late Collection respectively. A new 80km/h limit is also planned for sections of the N70 Kenmare to Sneem road, for instance from approx. Reen to Cappanacush, and from east of Blackwater Bridge to just before McCarthy Motors outside Sneem. West of Sneem, the N70 Sneem to Waterville road will continue at Tempo 80 all the way to Waterville, slowing down to 60km/h passing through Castlecove and 50km/h passing through Caherdaniel. Special Speed Limits of Thirty Kilometres per hour (30km/h) on all roads within the housing estates of Ard Bhearna, Cill Mhuire, Dromneavane, Gortamullen, Railway Crescent and Scarteen Park. The remaining public roads within the immediate town area, well defined on the relevant Map No. 132, will remain at Fifty Kilometres per hour (50km/h). Note that there are several speed limit changes proposed on various approach roads into Kenmare. For instance, the sign indicating a speed reduction from 60 to 50km/h coming from the direction of Kilgarvan will be moved to just east of the Sheen View Holiday Homes entrance, including all of the Killowen Road in the Tempo 50 zone. Heading into Kenmare from the Bonane side however, it’s proposed that you’ll be able to travel at 80km/h until you meet the new 60km/h sign at Riversdale, from where you can traverse the Sound Bridge before slowing down to 50km/h just past Sallyport House. Special Speed Limits of Thirty Kilometres per hour (30km/h) on all roads within the housing estates of Healy Rae Park, Limewoods and St Garvan’s Terrace. Kilgarvan, too will see 50km/h speed limit signs move closer to the village in all but one approaches, allowing for best practice of slowing traffic gradually by introducing 60km/h zones instead of sudden changes from 80-100km/h down to 50km/h. Special Speed Limits of Thirty Kilometres per hour (30km/h) on all roads within the housing estate of Sea View Cottages. All other public roads within the village, as shown on Map No. 131, will remain at Fifty Kilometres per hour (50km/h). Approaching Sneem on the N70 from the Kenmare side, a transition to 60km/h is proposed just before McCarthy Motors, slowing further to 50km/h before the village proper. At long last, a much needed Special Speed Limit of Sixty Kilometres per hour (60km/h) is to be introduced at the dangerous junction of the N22 Cork to Killarney road with the R570 Barraduff road at Glenflesk Church. Similarly, a long campaigned for Special Speed Limit at the literally lethal junction on the N22’s Killarney Bypass with the L2033 Kilcummin Road and the Upper Lewis Road is finally supposed to be introduced. Although, in my opinion, the proposed Eighty Kilometres per hour (80km/h) limit doesn’t go half far enough, every little helps to hopefully avoid further crashes and fatalities on this short stretch of road. The Draft Bye-Laws together with their accompanying maps are available for inspection by the general public from 4th July last to Friday, 10th August 2018. They can be viewed on KCC’s website (www.kerrycoco.ie/draft-speed-limit-bye-laws), or hard copies can be read in KCC’s Kenmare Area Office above the Library, during normal office hours. Submissions and observations on the Draft Bye-Laws may be made in writing to: Administrative Office, Operations Department, Room 115, Kerry County Council, Council Buildings, Rathass, Tralee, Co. Kerry, or by email to roads@kerrycoco.ie. So, if you have something to say before the Draft Bye-Laws are adopted by Kerry Council Council, speak up now; don’t complain later. You still have plenty of time to make your voice heard.